Action RPGs are a bit hit or miss for me. It seems like they are either overly complicated or simply redundant and unimaginative. However, as a huge Zelda fan, I just couldn’t resist giving Windscape a spin. Created by Magic Sandbox, it is inspired by the Zelda franchise, while simultaneously trying to break out of the stale Action RPG mold. In Windscape, you play as Ida, a young woman living on her parent’s farm in a world comprised of floating islands. As you explore, collect crafting materials, and run errands for your neighbors, you realize something is terribly wrong. The islands that make up your world have started to break apart and fall from the sky. Ida must discover what’s causing it and stop it. There are 4 main aspects of the game: crafting, exploration, quests, and combat. All are simplified versions of what we normally see in Action RPGs. You won’t find skill trees, leveling, or classes in Windscape. Your strength comes from the stats of the weapons you craft. Your defense comes from the stats of armor you craft. Skills are also crafted so you choose, based on the materials and recipes you have, which skills you’ll possess. As you can see, crafting is a huge aspect here. Crafting materials are located throughout the world, ripe for collecting. You’ll find crafting stations for food, weapons, armor, potions, and skills pretty often, even in dungeons. All you need is the recipe and the right materials to craft anything in the game. I thought the simplified crafting was a very well done and much-needed breath of fresh air. The exploration is fun, with NPCs and enemies scattered about, and plenty of nooks and crannies to find. There are also save points (which heal you) strategically placed throughout the world (including dungeons) so I never had to backtrack to find one. If you are expecting a Zelda or Skyrim type of environment though, you’ll be disappointed. The 3D polygon graphics are colorful, but they aren’t “pretty” by any stretch of the imagination. As long as the environment is crisp and clear, I’m not picky and don’t require a game to be “pretty”, so the graphics didn’t bother me. I really enjoyed exploring every corner of this world. There were issues with exploration. First, is the inability to see the map while you explore. Opening your inventory to open the map every time you need it is a pain. The compass is very helpful, but it would be more helpful if it could be used with the map. Second, the map isn’t detailed enough. They’re basically blobs of color devoid of landmarks or details. The dungeon maps aren’t only lacking details; they don’t show you where you’ve been either. During your travels in Windscape, you’ll find many NPCs with quests for you to do. Most of these are your typical “fetch” quests. None of them were particularly difficult, and your objective is easy to find because of a marker on your compass. Although they weren’t exciting, per se, they were fun and didn’t feel repetitive. That brings us to the combat. The combat, like the crafting, is pretty simplified. Enemies are weak to and strong against different damage types (blunt, slash, piercing) and elements (fire, ice, arcane), and their weaknesses/strengths are shown on the life bar above their heads. The best parts of the combat are sprinting and blocking. You can sprint in any direction, which makes dodging easier. Blocking is almost instantaneous, so you can easily prevent damage. I didn’t enjoy the combat though. The controls were smooth, but the configuration felt awkward. This is especially true when firing a bow. Holding down the right trigger while moving the right stick to aim vertically, was uncomfortable and felt strange to me. Another problem is the camera. The camera is zoomed in so far that you can only see the enemy directly in front of you, but you can’t see the life bar above the enemy’s head. Also, there were many times I took damage because an enemy was beside me pounding away and I had no idea where the damage was coming from. There are other design elements in Windscape that, while not exactly problems, are strange and bothered me. Money takes up a stack in your inventory and stack count only goes to 99, so if you have more than 99 coins, you can’t tell exactly how much money you have. Loading screens don’t have any sort of animation or changing image. Many times, I thought the game had frozen when it was just a long loading segment. All in all, Windscape is a decent game. It’s not the best Action RPG I’ve played, but it is fun. It is definitely a great introduction to Action RPGs if you’ve never played one. It would also be great for older children not ready for the complexities or gore of something like Skyrim. If you like first-person, Action RPGs, give Windscape a try. You might enjoy it. 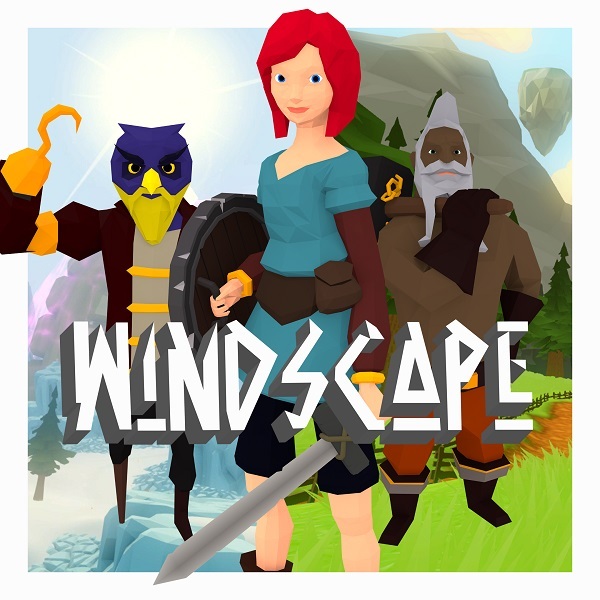 A Nintendo Switch review copy of Windscape was provided by Headup Games for this review. Lisa Aplin is a native Texan who enjoys books, movies, music, and most of all gaming. When she's not hacking and slashing her way through an RPG you will usually find her with her Sims. She prefers games that challenge her mind and make her think but her favorite games have a good story or let her create her own.